Over the last 7 days or so, I ‘ve been reviewing all of the responses to a few questions that people on my VIP Contact List had answered in a form they filled out called the “Tell Pam” form. The main question was centered around getting to know what their biggest marketing challenge was. What I found out was that almost 90% of the people who responded had the exact same challenges. It didn’t matter if they were an author, speaker, entrepreneur or business owner; they all said the same thing in different ways. Before asking people about their situation, I thought that the answer I would give would be different for different people, but I quickly realized that what they all had in common was not having a basic understanding of marketing and branding principles. It became immediately evident that most people are simply making the mistake of promoting their books, their services, their products, or themselves before they had positioned themselves properly, and before building a strong platform. And, of course, this leads to low sales (or none at all), hardly any engagement from your target audience, and if you try to get media attention they will dismiss you. So what do I mean by “platform”? I mean the number of people you are influencing; the eyeballs and ears that are paying attention to you. If you’re an author, building a strong platform will make it easier to sell more books. If you’re a speaker, building a strong platform will make it easier to get speaking engagements; especially the kind where people are willing to pay you what you’re worth. If you’re a business owner, building a strong platform will make it easier to attract more clients and sell more products. I want to make it clear that when I say “easier” I mean you will get to the point where people will start chasing you, instead of you chasing them; and, if you were to go to them, they will say “yes” without a second thought. Having a platform is also important if you want publishers, movie producers, etc. to promote your story. They have to invest thousands, so they want to know that it will sell; and one way of judging this is by evaluating your platform. They don’t care how great the story is; you have to have a platform/popularity. So today I’m going to start from scratch and share with you a marketing strategy that works 100% of the time; which includes building a powerful platform. Make sure that you bookmark this post and take notes. What do the people you are targeting really want and need? The more you know the market, the more you’re able to position yourself to sell your books or other products and services to them. You’re doing all of this promotion: getting on Facebook and Twitter; engaging with people on LinkedIn; taking photos and posting it up on Instagram; maybe doing a few speaking engagements here and there…but really, it’s all useless if you don’t really know what the market you’re trying to reach wants! You’ve got to know their hopes, their dreams, their beliefs, their values…because the more you know the market, the more you can actually speak to them; talk to them and really go deeper with them in terms of really providing, not just one book or product, but you become their source for more related material. Don’t assume that just because you think they want to hear what you have to say that that is the reality. It’s not about you, it’s about what they want. Do your due diligence and find out what that is, because it may be that you don’t even have a market; meaning: no one really wants what you’re selling. And if you say, “Ok, we’re going to create a million smurf cupcakes.” Well, no one really wants those smurf cupcakes, it’s really useless at this point. So, you want to make sure that there is a market for it as well. You can then really create a very lucrative business, or have a lot of readers and get your message out there if you take time out to really research and understand your market BEFORE you start promoting to them. Once you do your research, you may find out that you’re simply promoting yourself to the wrong market. In this case, it’s just a matter of changing who you promote yourself to. You’ve got to understand what your platform is; what your brand is. 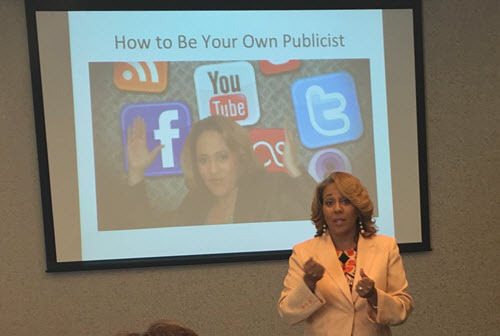 You see, before you even send out one eblast, or before you even call one radio station or try to get into somebody’s magazine, you’ve got to know where you fit in the market. You’re targeting a market, so you need to know how you want to be perceived by that market. What is the perception that you want people have in their mind about you? You’ve got to really get that perception right for the people, for them to really think about you in the right way in the market. So, how you position yourself is very, very important. Every touch point of your brand positions you further in someone’s mind. So you’ve got to think about everything – in terms of your look, the colors you choose, your website, the type of media that you have, etc. If you have a book, what type of endorsements? That really positions you in the market as well. Well, okay, it’s a business book, but if you get an endorsement from TD Jakes – yes he’s famous – but it doesn’t position you in the right market where you want to go. So that’s what I mean by positioning. You really have to know who it is that you are – as a person, as a brand. And then make sure that you are going after every touch point so that the market who you’re going after understands who you are and what you’re about. Remember this: How you position yourself determines the type of people you will attract. Thinking about how you want to be perceived will allow you to narrow things down a bit. Is it more probable that Group A will perceive you in the way that you want…or is it more likely that Group B will perceive you the way that you want to be perceived? Really think about who you are and what you’re all about, and then you will be able to choose a market that resonates with your message. Once again, you first have to know the market! That is the main thing. Then you create something that satisfies their want and need, and only then will they be attracted to you. At this point, you’re not trying to get them to buy anything from you (I’ll talk more about creating a paid offer later); instead, what you want to do is create an offer that’s good enough to sell, but instead of selling it, give it away so that you will attract more people to you. You want to spread your message and attract people to you BEFORE you try to sell them anything! One of the biggest reasons why you’re not making any sales right now is because you’re trying to sell something before you’ve even built a rapport with people. The very first step to building that rapport is to offer them something for free that relates to what they want and need. So start working on your message to your market, and make sure that it resonates with them. This message can be created and promoted in many forms; such as a book (or ebook), audio lessons, videos, blog posts, etc. However, before you start thinking about promoting your message, you’ve got to get your message down first. Start thinking about what you want to say and how you want to say it, while keeping your target market’s needs and wants in mind, along with how you want to position yourself. Continual marketing consists of a formula comprised of 4 basic parts. If you implement these four parts– especially online – you really WILL have success! I remember an author client of mine that was just so ecstatic because she was just getting tons and tons of people signing up on her list all the time. Well one, we narrowed down who her market was. Once we knew that, we knew what the message to that market was going to be. And then she started promoting that message properly. Now there’s a lot to go over when it comes to explaining this 4-part Continual Marketing formula, so what I’m going to do is save this explanation for Part 2 of this series. Alright, so I just gave you an overview of the first couple of steps you need to take in order to see results. You absolutely must know your target market and know how you want to be perceived by that market. This is how you get your positioning right so that you can build a strong platform. What I’ve shared with you today is the foundation of your platform. Next, I will go over the way to build on your foundation to create a strong platform and get out there; that’s what Continual Marketing is all about. So in 2 days you will receive Part 2 of this Marketing & Branding training series. That’s right, on Saturday (August 27, 2016), you will receive an email from me with a link to the page where I explain my 4-part Continual Marketing Formula: Build a list; Build a hub online; Have a great offer; and Be branded. Make sure you keep an eye on your email inbox so that you receive the link to Part 2. If you’re not already on my VIP Contact List, click here to be added so that you receive the link to Part 2 of this series. Part 2 has now been published here. Thanks Pam! This is awesome. Joseph, you rock too man. I see your gravatar! 🙂 Good going! You’re on your way. Just keep reading and applying the info! More to come! Please hit the share buttons to share this info to your friends on FB and Twitter. This was very helpful & extremely generous of you. Your dedication to the success of others is clear. I am looking forward to part 2. Thanks! Awwww. Thanks Darlene. You know when I help others win – we all win! Praise God! Thanks Darrin. We want you to be a success. It’s all about marketing THE MESSAGE.